Many visitors to the Philippines may ask which SIM card is best in Boracay and the Philippines, or which cell phone provider has the best service. For the best value and convenience, consider renting a mobile WiFi hotspot, available for pickup for visitors leaving from or transiting through Taiwan. The major mobile telecom companies in the Philippines are Globe and SMART. While both provide decent service, the SMART network is more modern and provides limited LTE service throughout the islands, as well as more reliable service at a slightly higher price point. For visitors, it is recommended to purchase a SMART SIM card for use during your stay. The recommended card for purchase is “SMART Bro”, a card designed for usage with “tablets or other data devices”, however, it also has a telephone number and works fine in a smartphone. SMART staff will insist that it is data only, but in actuality the card operates fine making phone calls and sending text messages for the few times it may be necessary. Most travelers with smartphones are more adept at using the Internet, so this SIM card is actually a great value, as it also provides the ability to make one-off phone calls or text messages if required. Purchase a “SMART Bro” SIM. It costs ₱50, and service is activated immediately, so first turn off your cellular data in your smartphone so it won’t eat all your prepaid credit before you purchase a data package. The card included is a “3-in-1” card that fits Regular, Micro-, and Nano-SIM. There are 3 choices for unlimited LTE data service, send the bold code text in an SMS text message to the phone number 2200 (note there is a space). Other packages are available in the handbook that comes with the SIM card including Facebook/Twitter access at promotional rates, etc., but signing up for one of the 3 listed packages here is more convenient and still very affordable for travelers. It is recommended to load your prepaid account with enough money to cover your LTE data package with some left over to make an occasional phone call or text message. 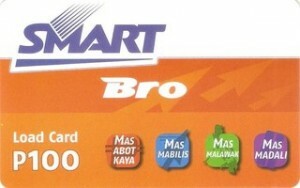 Be sure to purchase SMART Bro Load Card or verify with the merchant that your card can be loaded (recharged). To recharge your account, scratch off the back of the load card, and simply dial the number 1510, followed by the load card 14-digit PIN, then call the number. A voice will inform you if the load was successful. Although the promotional materials advertise LTE service, in actuality, LTE service is still quite limited. Your handset will still connect to 3G without issue when no LTE is available. In general, the telecom networks and the Internet in the Philippines can get very, very congested, so please have patience when using data services. It is also recommended to allow your browsers to change to local Philippines servers (such as Google.com.ph) if prompted for much faster service. Your new SIM card’s phone number will not be shown anywhere on the packaging because it is being sold as a data SIM card. Visitors report that staff are often unaware of the features of this specific card, as it is not commonly purchased. Simply checking through your handset settings (or on iPhone at the top of your contacts list) will reveal “My Number”. If you have access to the SIM applications (found on iPhone under Settings, Phone), you can also get more information about your service. 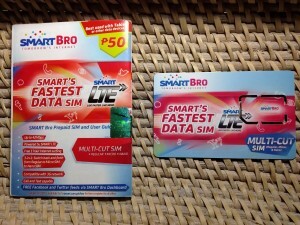 SMART offers a smartphone application to track account information at http://smart.com.ph/bro. There is a SMART official retailer located at Station 2 inside D*Mall.